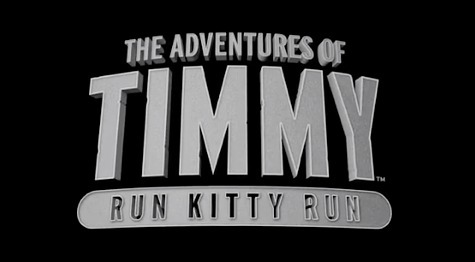 Platform gamers can rejoice as the old school style gaming is reaching a new audience in the format of The Adventures Of Timmy: Run Kitty Run. Many gamers love the simplicity and challenge of platform games and this iOS app does not disappoint. You will become frustrated, stressed, and you may even want throw you iPhone out a window as a result replaying a level over and over again. This is certainly not a letdown and nor it is due to bad implementation of the controls. The controls are some of the best ever in a touch screen game. As with most platform games there are no difficulty choices for gamers. The game itself grows in difficulty as you proceed through the storyline. This gives a great sense of excitement and achievement when a level is passed. You will assume initially the game is challenging but not impossible. You will quickly find out this is not the case and depending on your skill level you may find yourself spending countless hours trying to clear a specific level. You assume the role of Timmy, a shy boy who is the target of the school bully, Mitch. This is all brought about because Timmy wears a cat costume to school. When Kitty the prettiest girl in school reaches out to Timmy, Mitch lashes out in jealousy and kidnaps her in his treehouse. It is then up to Timmy to go after him and free her from Mitch’s latches. This sounds familiar and is reminiscent of almost all platform titles. The bag guy kidnaps the girl and the good guy traverses the levels to become the hero and free the girl from a possible life of tyranny. As familiar as it may appear on the surface the developers have taken the time to make the story unique. 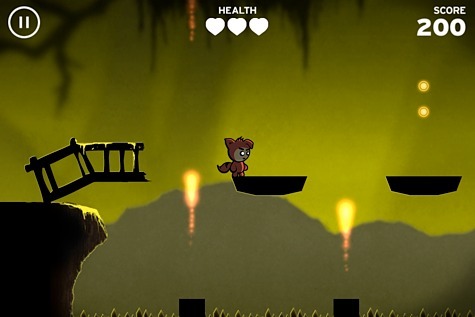 Throughout four chapters, 36 levels, and three boss battles to rescue Kitty you will endure some of the most challenging platform gaming you have ever experienced. 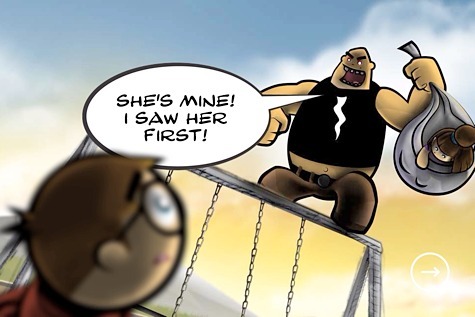 The story is complemented with amazing graphical cutscenes that are presented in comic book format. Upon starting the game you will be blown away with the visual quality on the iPhone. The game is optimized for the Retina display. The lighting of the virtual world superb and much of the foreground is silhouetted against a vibrant background. You may assume this would make your character and opponents difficult to see. In fact this is not the case. Every character and obstacle is clearly identifiable and you will not at any stage find yourself lost or unsure of where to go. The audio quality is also top notch and is not as repetitive as other games I have played. Each chapter delivers a new background track that stays with the game throughout the chapters nine levels. Gameplay is without doubt the most important element especially in a game genre that is somewhat reliant on traditional tactile button controls. As touchscreen games grow in their popularity the emergence of virtual controls is becoming more refined. I would advise developers of platform games to take a look at this app as the controls are solid and perform perfectly. Upon requesting Timmy to jump the response from the onscreen controls were immediate. Jumping also brought about an interesting conundrum. When I wanted to jump higher or further how could this be achieved? The developer has successfully been able to master the controls. A soft tap will produce a small quick jump whilst a hard tap will produce a much higher or further jump. It is these small features that place this game at the top of its category. Movement was equally impressive and the virtual controls will move independently as you are playing the game. As you traverse the Mitch’s treehouse you will come across a series of bizarre enemies including a Zombie version of Timmy and a raging electric bunny. In classic Mario Brothers style gameplay you simply jump at the appropriate time on the enemy to eliminate them. You will find yourself wanting to replay each level to obtain all the hidden objects throughout the game. The challenge is expanded with leader boards and achievements available through Apple’s Game Center App. This iOS game is the cream of the crop for platform games. It is addictive, frustrating, and highly satisfying all at the same time which makes for a experience like no other. With a launch price of US$0.99 you would be crazy not to pick up this extremely polished game. 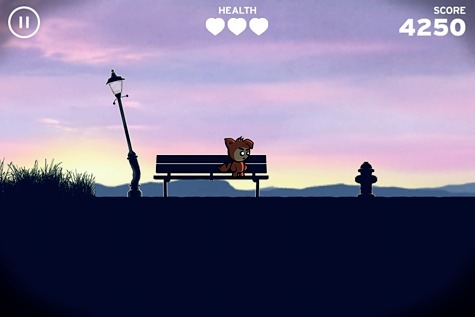 At present the game is for iPhone/iPod Touch only. The game would be perfectly suited for the iPad and I recommend the developer consider releasing a universal app via an update in the near future. Therefore I awarding this iPhone/iPod Touch only Game a MyMac.com score of 9 out of 10. Pingback: When you think about it, all physical media is dead!